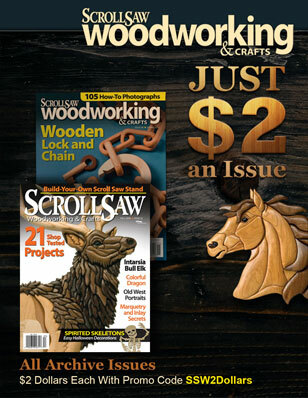 Created by Ray Seymore of Seyco, who has been selling Excalibur saws since 1986, this saw is intended for scrollers and has features designed specifically for these woodworkers. Like the Excalibur saws, it uses a link drive system and has a tilting saw arm (insets of a tilting table). But it has a few special features. Most notably, when equipped with special blades, the Seyco saw can cut wood up to 2 ½ ” (64mm) thick, which far outstrips most scroll saws. However, this comes at a cost: the head will only tilt 30° in either direction. The saw is therefore valuable for folks who cut thicker wood but can prevent you from cutting some bowls and vases. In addition, this saw has a niche for and comes with a Wixey digital angle gauge, as well as a small engineer’s square. The two combined allow you to set exact angles, but in practice, we found the reaction speed of the gauge slowed our efforts. Unlike most scroll saws, the Seyco saw has a 90° angle on the tip of the dust blower. This required each of us to adjust the position of the blower because our standard positions didn’t work. Some of us found a sweet spot that kept the dust off the line without blowing it into our eyes or hands, but others were never happy with the angled blower. Top feeding is easy with this saw, which will please fretwork fans. The magnetic table cover is marked with concentric circles and intersecting lines around the blade hole that make finding the hole easier when it’s covered by the project. (The cover also allows wood to slide easily and protects the saw table from scratches and corrosion.) The table supports blanks of any size. Instead of a dust collector, the saw has a removable dust tray at the back of the saw; we didn’t find it overly useful. 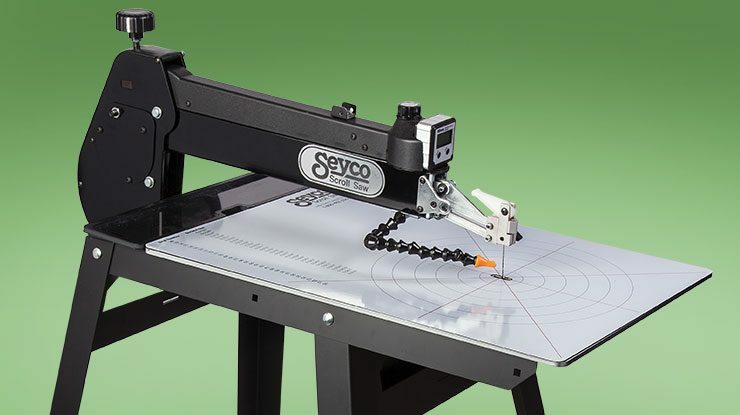 We expect many types of scrollers to enjoy the Seyco Saw, although the reduced cutting angle of the head may hamper some. 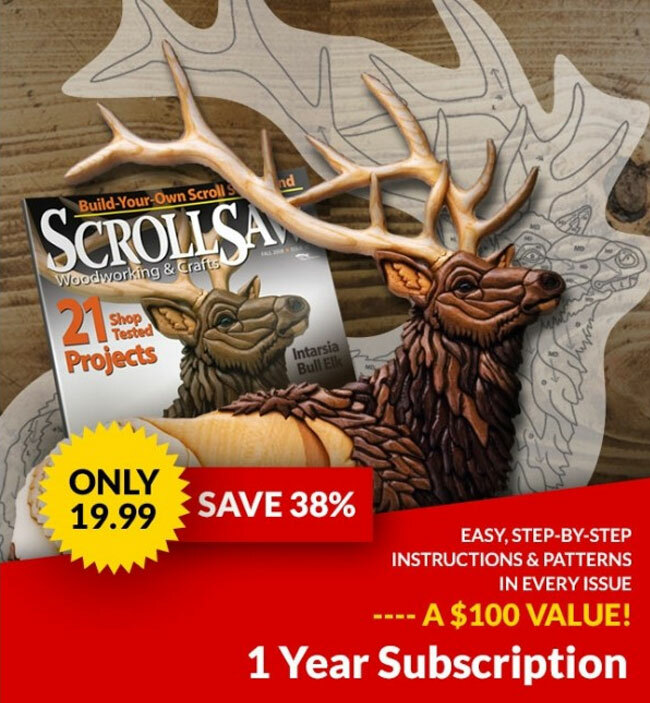 However, this saw’s features—especially the digital angle gauge and ability to cut thicker wood—may help it find an audience outside the hobby, as well. The Seyco Saw is available for $879 (with stand and foot switch) and free shipping from Seyco, seyco.com.